The New Nintendo 3DS, which is slated to come to the West sometime in 2015, will be region-locked. And just last year, Nintendo president Satoru Iwata justified his company's commitment to region-locked content. However, during this week's investor meeting, it sounds like that's not a set-in-stone policy for Nintendo. Form an unofficial translation of the Q&A following Nintendo's investor meeting on gaming forum Neogaf, Iwata responded to the question of whether his company had any plans to unlock the region-specific restrictions. The game business has a history of taking a very long time with localization among other things, such as having to deal with various issues of marketing in each particular country, or games that have made use of licensed content that did not apply globally, and had all kinds of circumstances, so to say, that region-locking has existed due to circumstances on the sellers' side rather than for the sake of the customers. In the history of game consoles, that is the current situation. As for what should be done going forward, if unlocked for the benefit of the customers, there may also be a benefit for us. Conversely, unlocking would require various problems to be solved, so while I can't say today whether or not we intend to unlock, we realize that it is one thing that we must consider looking to the future. While it's not the concession to finally abandon the practice that many fans may have wanted, it's still better than a blanket rejection. After all, up until the Nintendo DS, the Nintendo's handheld consoles were region-free. GS News Top 5 – Prey 2 Cancelled, Evolve Alpha delayed on PS4 and other PlayStation issues. Join Chris as he brings you the top 5 news stories of the week and holds a costume contest featuring GameSpot staff who dressed up for Halloween. Vote for your favorite costume in the comments! Foes can attack from any direction. Unlike other RTS games with traditional flat maps, the battlegrounds here are full globes. Planets look rather cartoony, as they are extremely tiny, your units are spectacularly huge, or both. But they form effective theaters of war and feature various types of terrain ranging from ice balls, to desert worlds, to chunks of metal. It’s hard to get used to at first; RTS instinct might have you building defenses between your bases and the enemy, forgetting that all opponents must do to flank is to simply run around the globe. This strategic consideration caught me off guard in the early stages, and forced me to spend more time walling off bases and ensuring that I had proper turret protection all the way around against ground and aerial assaults. Call of Duty: Advanced Warfare is coming out in just a few days and we have a lot of coverage coming post-release. Until then, why not catch up on some of the news and features that you may have missed over the past few months. There's a lot to cover, so let's get to it, soldier! There are only a couple days left to preorder the game, but here's what you can expect to earn for enlisting early. And here's a detailed list of what you'll get if you purchase a season pass for Call of Duty: Advanced Warfare now, before the game's release. As previously announced, the Atlas Gorge multiplayer map (the remake of CoD 4's Pipeline) will be made available right from launch for anyone who buys the season pass, and you can see it in action in today's trailer. Above: A sneak peek at some gameplay from the official Call of Duty: Advanced Warfare launch trailer. If you're thinking about playing Advanced Warfare on PC, take a look at the minimum system requirements to make sure you're good to go. Above: Mark Walton explains how Advanced Warfare's multiplayer reinvigorates his spirits. Catch up on everything we know about the leaked zombie mode here, which was recently confirmed as authentic by one of the game's developers. Glen Schofield, the co-founder of Advanced Warfare developer Sledgehammer Games, appeared to confirm the veracity of the leak on Twitter. Above: Highlights from the new Uplink mode, in which two teams try to score points by bringing a spherical drone into opposing team's uplink zone. Mark Walton reflects the joys of smart grenades and jetpacks in this detailed breakdown of Advanced Warfare's futuristic facets. But then, how could a game featuring jetpacks and laser-guided smart grenades possibly not be fun? I mean, if you don't get a jolly from jetpack jumping off of a 10-storey building, guns blazing and smart grenades exploding as you pick off hapless soldiers on the ground below, it's time to have a long hard look about your video game priorities. Sledgehammer Games co-founder Michael Condry explains how Advanced Warfare benefitted from a three year development cycle. "I think that was really what that extra year gave us, the chance to break a few things...to maybe alienate a few ideas to bring Sledgehammer's take to Call of Duty. And maybe push boundaries further than people were comfortable and then pull it back if we went too far." In the market for a last-minute Halloween mask that's both cheap and terrifying? 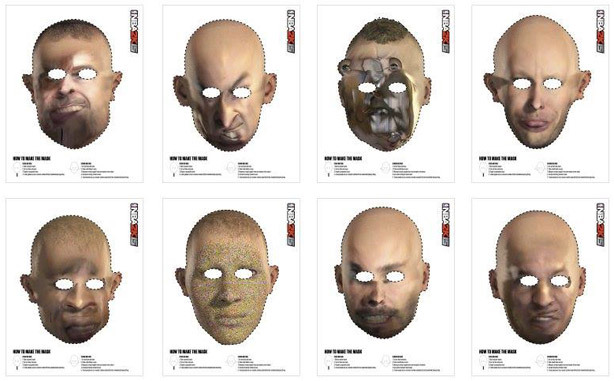 2K Sports has released a series of print-out masks inspired by NBA 2K15's infamous face-scanning feature -- an ideal finishing touch for that Texas Chainsaw Massacre costume you've been working on. Ostensibly designed to allow players to map their own faces onto NBA 2K15 players, the face scan feature instead generated sheer horror in the wake of the game's launch earlier this month. The mechanic left many custom-created players with misshapen facial features, multiple sets of eyes, and other uncanny disfigurements. Instead of locking its unholy creations in the basement, 2K wisely decided to repurpose its barely-human menagerie for Halloween fun. It all makes sense now. See, that character you generated with a tongue sticking out of his neck wasn't a glitch -- he just showed up to the costume party a few weeks early! NBA 2K15 face scan nightmares are now Halloween masks originally appeared on Joystiq on Fri, 31 Oct 2014 18:00:00 EST. Please see our terms for use of feeds. Welcome to Camp Forest Green, where your sleeping bag... Will be your body bag! Watch extended gameplay footage from Sherlock Holmes: Crimes and Punishments featuring the Giant Bomb crew. In lieu of rebuilding Grand Theft Auto: San Andreas from scratch for its recent Xbox 360 re-release, Rockstar Games simply ported the existing Android version of San Andreas to Microsoft's console, according to the tech sleuths at Digital Foundry. In a test comparing numerous versions of San Andreas, Digital Foundry noticed numerous similarities between the Xbox 360 and Android releases. "Viewed side by side, Xbox 360 and [Android-powered] Shield Tablet games appear to be a close match - the higher-resolution 2D artwork and the new front end are much the same, though the new console release appears to possess enhanced draw distance over the Android version (even when it's set to 100 per cent on the mobile version)," the report states. "Unfortunately, aside from the inclusion of Achievements, there's very little love given to this new edition. Just like the Android release, there's absolutely no anti-aliasing available, whereas even the original PC version supports this, while the vast majority of Xbox Originals on the 360 emulator supported 2x or 4x MSAA depending on the title." Further, Digital Foundry notes that the game's mobile roots have left its framerate capped at 30 frames per second, a decision that results in frequent hitching and stuttering. "What could have been an opportunity to produce the ultimate, definitive version of GTA: San Andreas comes across as something of a missed opportunity," the group concludes. 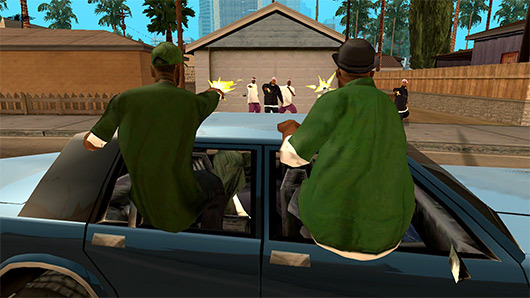 Report: Xbox 360's GTA: San Andreas HD is an Android port originally appeared on Joystiq on Fri, 31 Oct 2014 16:30:00 EST. Please see our terms for use of feeds. Square Enix today uploaded a video from the Paris Games Festival that shows off new gameplay from Final Fantasy XV. Titled "Tabata Director's Active Time Report," the lengthy video doesn't actually get into the gameplay for FFXV until 33:24, but it does give you a glimpse of part of the game's scope with lots of walking, close-ups of huge dinosaur beasts...and a gas station. What do you think about the game so far? It's been a long wait for Final Fantasy XV, but graphically it seems to be shaping up to be pretty impressive.